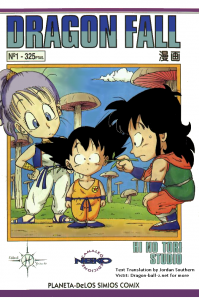 In 1997 Nacho Fernandez and Alvaro Lopez released this Spanish spoof Manga based on Dragon Ball. The series went on for years and made 50 volumes which have been translated into several languages over the years but so far there has been no official English translation. Artwork wise they have kept it very similar to that done by Akira Toriyama and by adding cameos from numerous other series like Transformers and Gundam it’s got a whole new level of humor. The characters names have changed in most cases but their roles in the series have very much stayed the same. There series was a great extension to the original Dragon Ball manga mainly due to Akira Toriyama leaving millions of fans all over the world wanting more and that’s where Dragon Fall came in. In Spain and France Dragon Fall is in most book shops but with us still wanting an English Translation we decided to make our own. With an original plan to fan translate all 50 volumes becoming more unrealistic due to it probably taking us four years we may translate select volumes in the future.